After a day of sunshine and seaside fun, kick back and relax in your air conditioned home-away-from home enjoying such in-suite amenities as complimentary high-speed internet, washer/dryer, fully-equipped kitchen and television with cable channels and DVD player. Spacious one-, two- and three-bedroom units in this spectacular high-rise hotel all feature private balconies perfect for sunset cocktails overlooking sweeping views of the Gulf of Mexico. Varying extras in units include granite countertops, tiled baths, stainless steel appliances, garden tubs, separate laundry rooms and walk-in closets. Corner units may feature wraparound balconies overlooking awe-inspiring ocean vistas, and some one-bedroom units can sleep up to six courtesy of a built in bunk bed area and sleeper sofa. 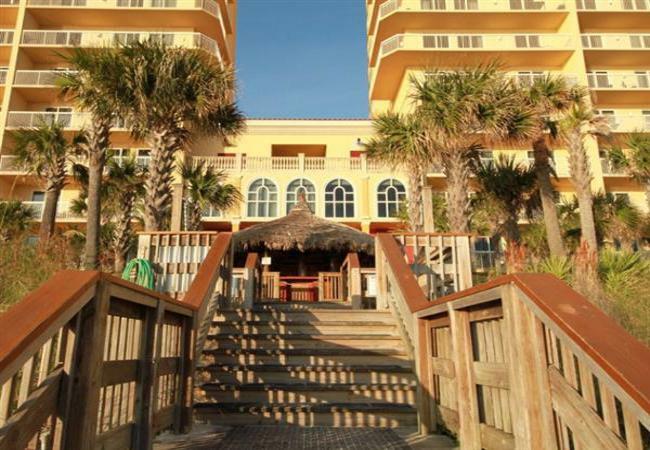 These Panama City beach condo rentals boast amenities including private beach services, a community center and a fully equipped fitness center. Two magnificent 175-foot free-form heated beachfront pools are set amid lush landscaping overlooking the translucent aqua waters of the Gulf. Stroll across soft white sands to Calypso’s beachfront Tiki Bar to meet old friends or make new ones while toasting the sunset with colorful cocktails. A stay at this resort puts you in the heart of the Panhandle’s incredible outdoor recreational opportunities. Head out onto the sparkling Gulf for fishing, kayaking, parasailing, jet skiing and sailing or dive into crystal clear waters on exciting diving and snorkeling excursions. Water parks, mini golf and amusement parks make this one of Florida’s most popular family holiday destinations. There’s always something going on in Panama City, and Calypso Resort and Towers puts you in the heart of the action. From the famous New Year’s Eve Beach Ball Drop to spring’s Mardi Gras and Musical Festival, the award-winning Seabreeze Jazz Festival and Columbus Day weekend’s swashbuckling Pirates of the High Seas Fest, you and your family will have a blast in this lively, lovely little piece of Panhandle paradise.